Today, Thoreau’s Walden is more relevant than ever, but it has been said that the book’s readership is declining. I’d like to change that. While Walden has always been a challenging book, the evolution of language over the past two centuries has made it harder for modern readers to get into the text. I’m creating a newly annotated, hardcover edition of Walden that I hope will play at least some small part in solving this problem. My original plan was to fund this project through a Kickstarter campaign in early 2016. While we did not meet the fundraising goal, I learned some valuable lessons and discovered that there is a very enthusiastic audience for this book. The pledges I received would pay for about 500 books: halfway to 1,000, a respectable number for a limited edition. With a reduction in some of our hard costs, a smaller print run is now possible. Over the next year, I believe we can fill an order for 1,000 books. There will also be a digital version for broader distribution. After the Kickstarter campaign ended, necessity required me to take a hiatus and focus on business development. Now that my website is up and running, I am returning to Walden. The next step is to launch a preorder website. After that, I’ll chip away at the design and annotation work. Brooks, my illustrator, will also resume work on the project. As this project has evolved in recent months, I’ve come to think of it as the Thoreau Bicentennial Collector’s Edition of Walden. The new completion target is summer 2017, just in time for Henry’s 200th birthday. Once the pre-order website is live, Kickstarter backers will be the first to know, followed by people who have subscribed to my private email list. In addition to the hardcover book and PDF, I will offer an ultra-limited slipcased edition. 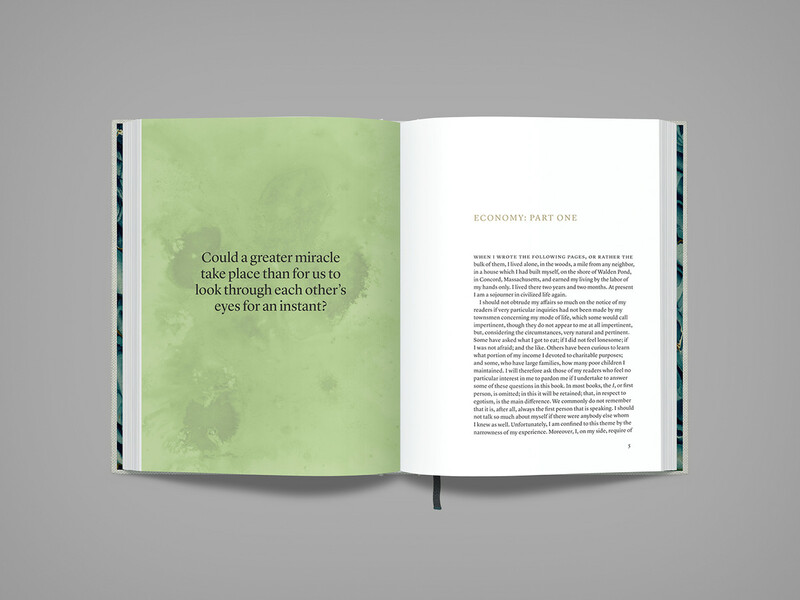 The slipcase will be simple, sturdy, and clothbound to match the book’s cover. The current plan is to print the slipcase on all sides with a detailed illustration of New England granite. Though it will take longer than we initially planned, I’m as determined as ever to see this project through to completion. As soon as I have orders for at least 1,000 books, I’ll notify the printer and start the production process. Find out more about recent developments in this Medium post. What makes this edition different from all the others? Annotated editions of Walden already exist, some of which include abundant commentary. That’s great for academic study, but a delightful reading experience for both newcomers and longtime fans is my primary goal. Our annotations will be relatively sparse. We don’t wish to create a study companion as much as an unobtrusive guide. The goal is to leave you alone with the text as much as possible, but to provide enough insight so that you can keep your smartphone in your pocket. Much of Walden remains accessible by today’s standards. 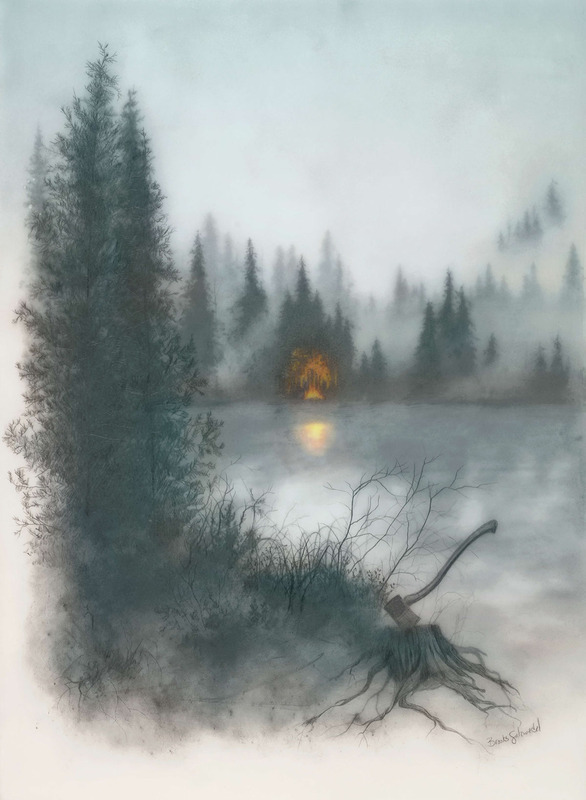 Our plan is to elucidate the archaic words and idioms in Walden, as well as the cultural, historical, and literary references that Thoreau uses to embellish and connect his thoughts. And when untranslated Latin appears in the text, we will include the English translation in the margins. Some annotated books use footnotes or endnotes, which can be tedious and fussy, forcing the reader to hunt for references. Superscripts or subscripts clutter the page and can distract the reader. Such elements have their place in textbooks and study Bibles, but would weigh down a book like Walden. Even the editions of Walden with friendlier side margins are tough to follow after several pages, because the main text and notes become separated. Instead, our notes are set off in the margins, right next to the lines they elucidate. Not only are such notes much easier to find when you want them, but they enhance the page’s aesthetic, ruffling like little prayer flags in the wind. Additionally, I am updating the structure of Walden, but not in a way that changes the content or its order of appearance. Presented in four distinct parts or books, each section begins with a gorgeous illustration (more on this below). 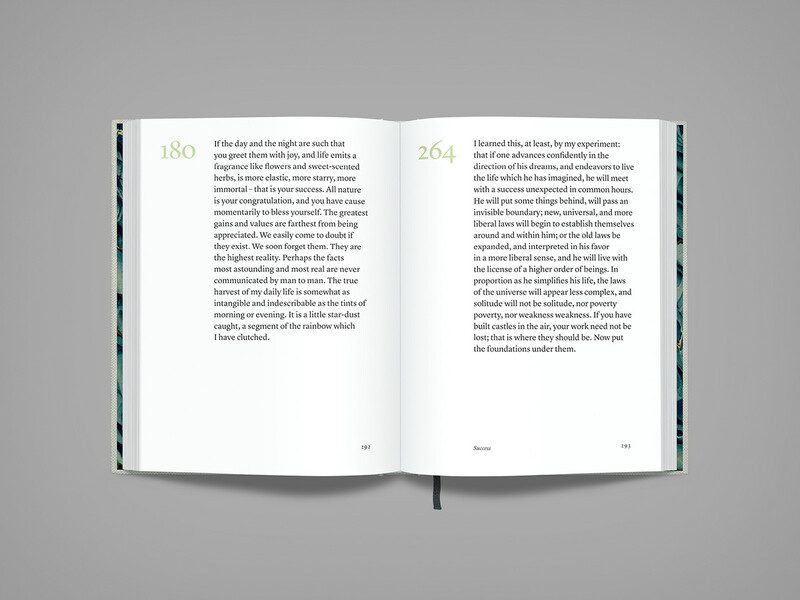 Economy, the book’s first chapter, is by far the longest, comprising nearly 25% of the entire text. I’ve broken Economy into five shorter chapters, and left the other 17 chapter arrangements alone. This yields 22 chapters of similar length. The content is presented in the same order as the original text, but the new structure creates a more sustainable pace and a better rhythm. Finally, we’re including a new section of prose poems selected from some of Thoreau’s most arresting sentences in Walden (more on that below!). A well-designed book is a visible reflection of the story, as well as its author’s persona and values. Thoreau was an early advocate for conservation, and sustainability is critical to this project. From cover cloth to paper and ink, all of this edition's materials will be high-quality, archival, durable, and responsibly made. And I’ll be partnering with a printing company that uses 100% renewable energy. 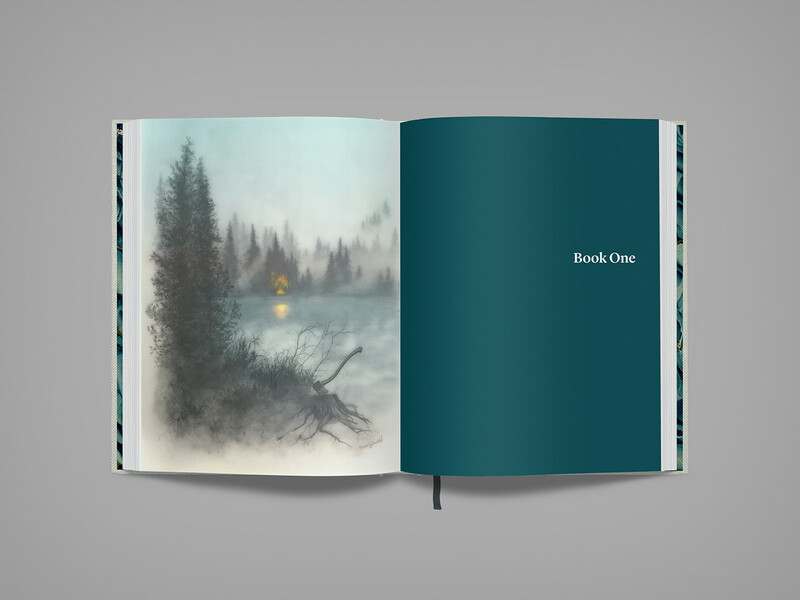 This book will be illustrated by a wonderful artist named Brooks Salzwedel. His images depict natural environments divorced from any usual surrounding or place in time. He draws and paints onto layered sheets of transparent papers and casts them directly onto panels. Brooks will create five full-color illustrations, which include an image for each section and a map of Concord, Massachusetts in Thoreau’s day. 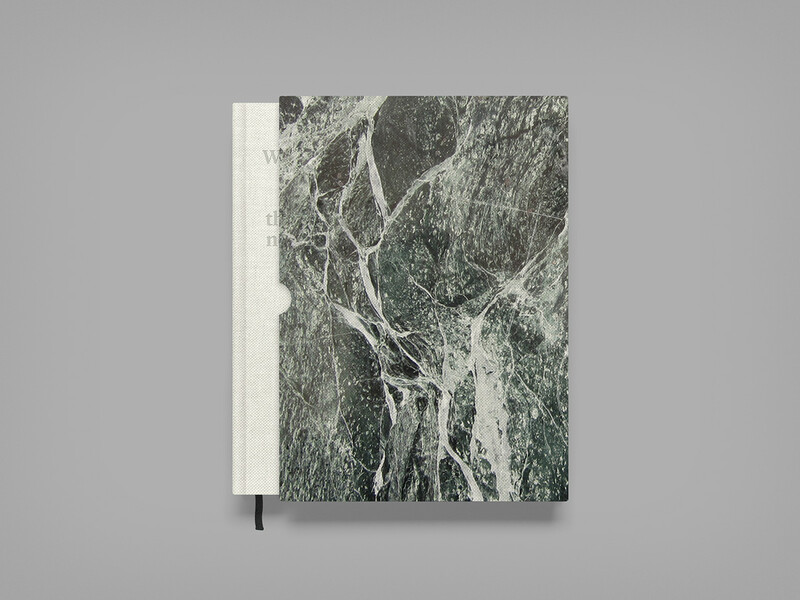 He will also produce marbled patterns for the endpapers and pull-quote pages. 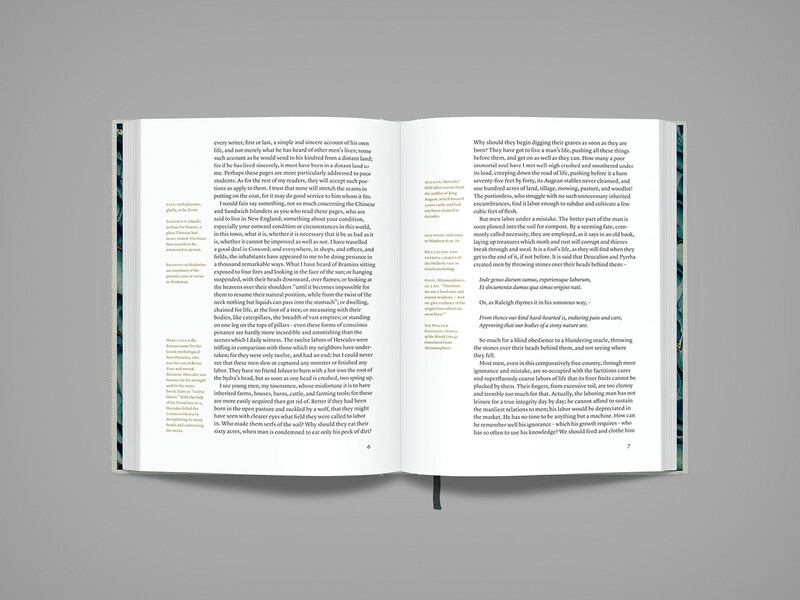 Typography is at the heart of this book’s design. After extensive research and testing, I decided against using fonts that are based on those from Thoreau’s day. Most of them felt either too stiff or too ornate for this project. I wanted something that was not only effortless to read, but also crisp, energetic, and timeless in its design. Since Thoreau was a poet, and his prose has a poetic ring to it, I wanted type with a lyrical feel. I found all of the above traits in the Lyon type collection, designed by Kai Bernau for Commercial Type in 2009. Lyon’s optical sizes means that I can use a single font family for everything from the cover to marginalia. 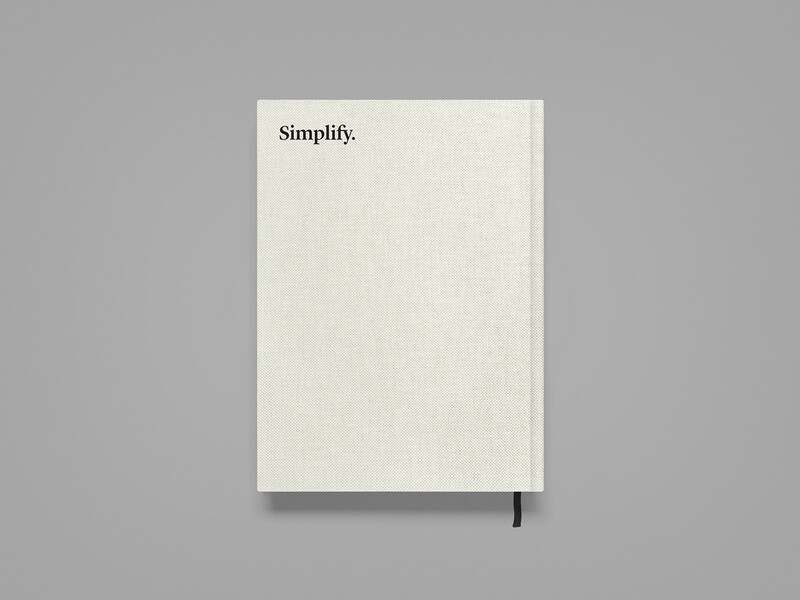 Simplicity, simplicity, simplicity! 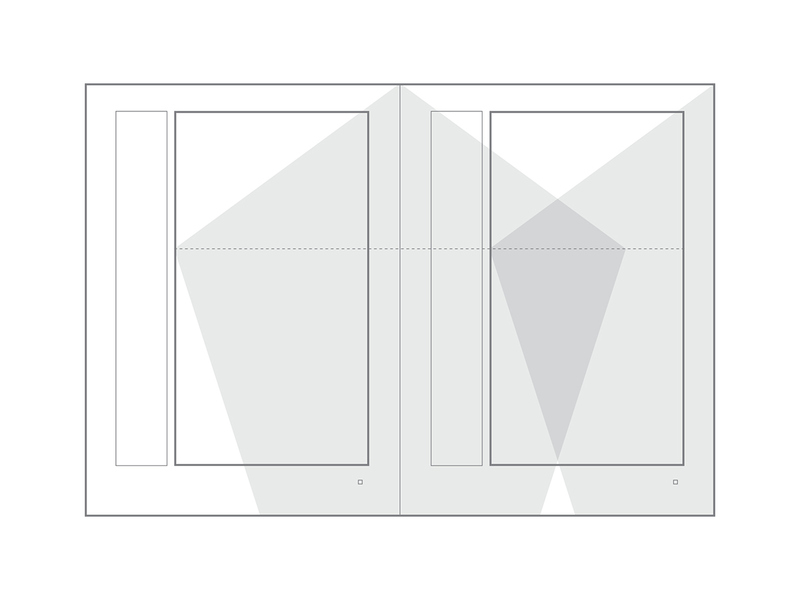 After selecting a typeface, the next thing to consider was the page size and shape. A book about living simply in nature deserves natural proportions. I wanted Walden’s layout to have a harmonious tension between the page shape and the text column. 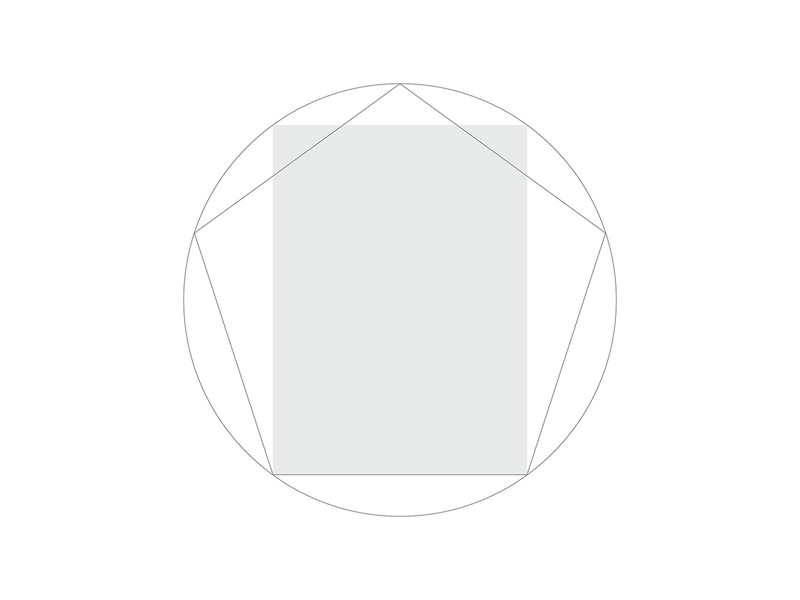 The page shape and layout are based on a short pentagon proportion, found in many living things from roses to starfish. Finally, Thoreau was an intense and active man by all accounts. He often walked several miles just to visit a particular tree or stream. 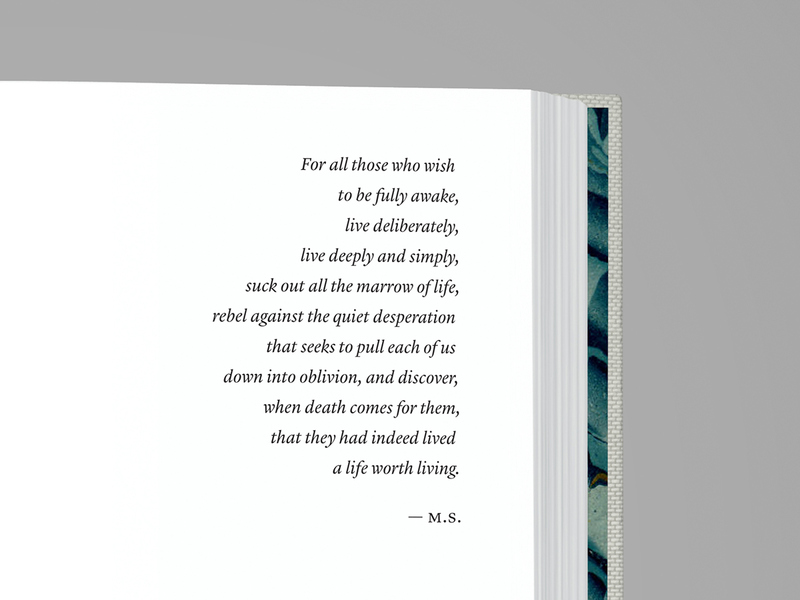 This asymmetric layout makes the words feel alive, as if they’re about to walk off the page and around the bend. Thoreau was a poet, but his best poetry was hidden in the midst of his prose. This edition features an all-new section at the end: A curated selection of Walden’s most beautiful passages, presented as prose poems and arranged in thematic pairs. By setting these selections in prose form rather than lineated verse, we can maintain the original format while highlighting each passage's aesthetic. 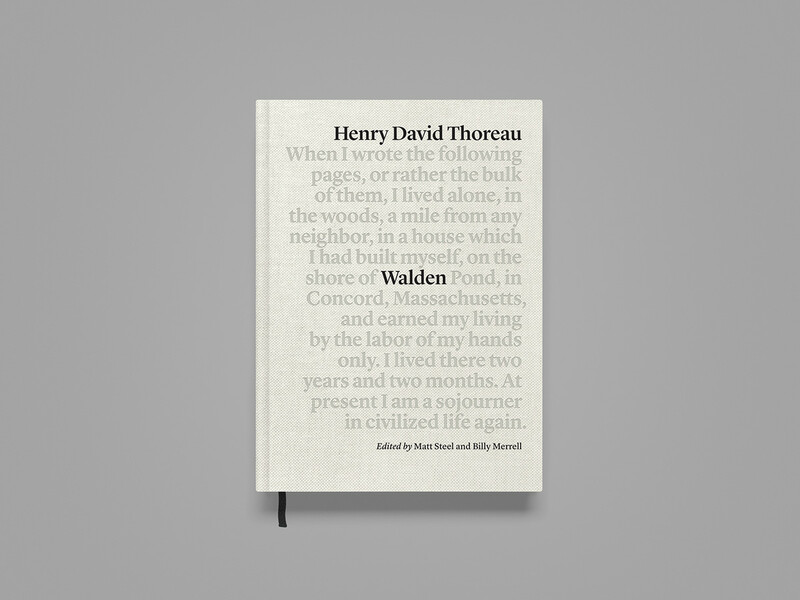 A new hardcover edition of Thoreau's classic work.